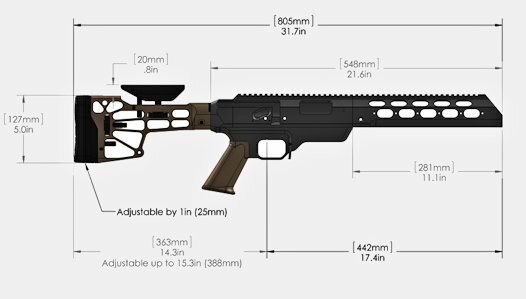 The MDT TAC21 chassis has an integrated full length Picatinny rail (MIL-STN-1913) in 20 MOA (Minutes of Angle) on top of action housing and forearm. The chassis also supports installation of bolt on Picatinny rail (MIL-STN-1913) accessory mounting rails on the fore-end and side of the action housing. Mounting holes are spaced for Magpul style L5 (11 slots) and L3 (7 slots) rails (1.600” / 3.200”). 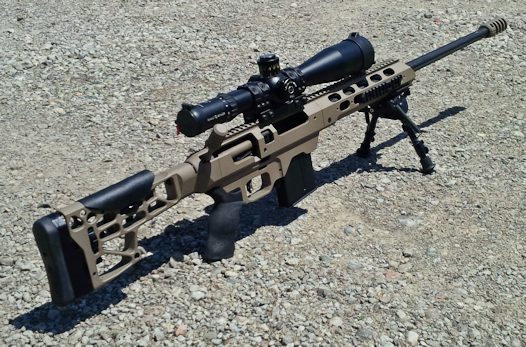 The MDT TAC21 chassis for Savage Arms supports Short Action AICS style magazine in .223 and .308 caliber and Long Action AICS style magazine (3.715" length) in .300WM and .338LM.